The multiple ligament injured knee is a severe injury that may also involve neurovascular injuries, fractures, and other systemic injuries. Surgical treatment offers good functional results documented in the literature by physical examination, arthrometer testing, stress radiography, and knee ligament rating scales. Mechanical tensioning devices are helpful with cruciate ligament-tensioning. Some low-grade medial collateral ligament complex injuries may be amenable to brace treatment, while high-grade medial side injuries require combined surgical repair-reconstruction. Lateral posterolateral injuries are most successfully treated with combined surgical repair-reconstruction. Surgical timing in acute multiple ligament injured knee cases depends upon the ligaments injured, injured extremity vascular status, skin condition of the extremity, degree of instability, and the patients overall health. Allograft tissue is preferred for these complex surgical procedures. Delayed reconstruction of 2–3 weeks may decrease the incidence of arthrofibrosis, and it is important to address all components of the instability. Currently, there is no conclusive evidence that double-bundle PCL reconstruction provides superior results to single-bundle PCL reconstruction in the multiple ligament injured knee. 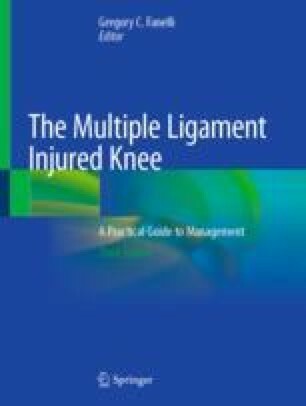 The purpose of this chapter is to discuss my surgical technique for combined posterior and anterior cruciate ligament, medial, and lateral side reconstructions in acute and chronic multiple ligament injured knees with global laxity. This chapter will focus on recognizing and defining the instability pattern, the use of external fixation, surgical timing, graft selection and preparation, the author’s preferred surgical technique, mechanical graft tensioning, perioperative antibiotics, specialized operating teams, postoperative rehabilitation, and our results of treatment in these complex surgical cases.